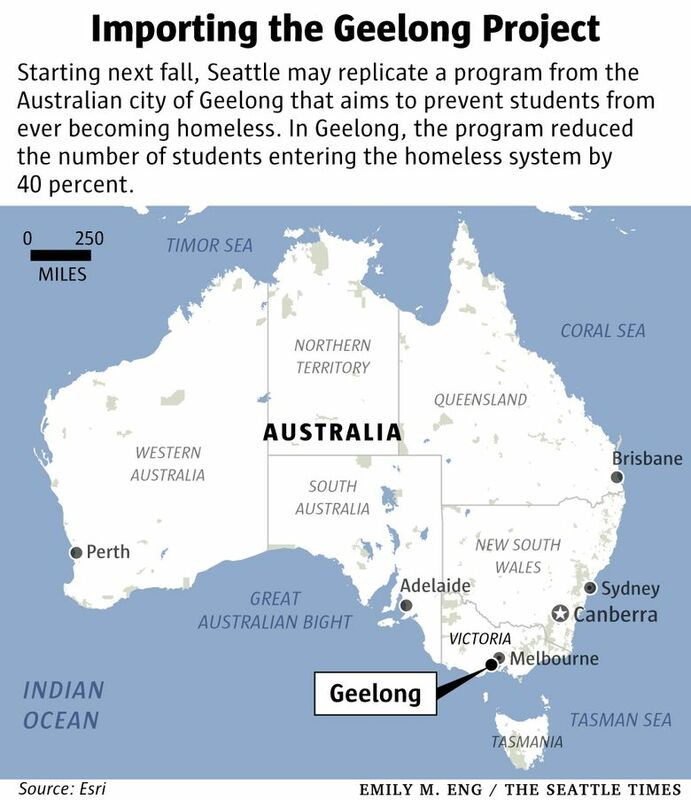 In response to rising youth homelessness across the Puget Sound region, Seattle may soon import a program from Australia that in one city reduced the number of students entering the homeless system by 40 percent. What if, instead of trying to end youth homelessness, we could prevent it from ever happening? A new approach that starts with that question to tackle a growing and ubiquitous problem in the Puget Sound region could soon come to Seattle, making it one of the first U.S. cities to import this idea from Australia. The tactic comes from Geelong (pronounced Jee-long), an Australian city about an hour southwest of Melbourne. Starting in 2013, a trio of schools there have screened all students for their risk of entering the homeless system or leaving school before 12th grade. The schools then connected students at greater risk with the public and nonprofit agencies that could provide services — rental assistance, mentorship, counseling — to keep them and their families housed, and out of streets, tents and shelters. Backed by a $1.2 million seed grant, the so-called Geelong Project has since reduced the number of youth entering the homeless system there by 40 percent, according to an interim report issued earlier this year. The number of students leaving school before the 12th grade dropped at the three pilot schools by 20 percent. Now, the Raikes Foundation — a Seattle-based nonprofit dedicated to ending youth homelessness — recently approved a roughly $160,000 grant to study what it would take for the Emerald City to host one of the first sites for the Geelong Project’s expansion to the U.S.
Across Washington state, the number of students living without stable housing climbed nearly 34 percent between 2012 and 2017. At 81 percent, the rise in student homelessness was even starker in Seattle Public Schools. Casey Trupin, program officer for the Raikes Foundation’s youth homelessness strategy, said it would be “a game-changer, nationally,” if Seattle could test a pilot of the Geelong Project. “We strongly believe that we’re not going to end youth homelessness without actually keeping young people from coming into homelessness in the first place,” Trupin said in a phone interview. 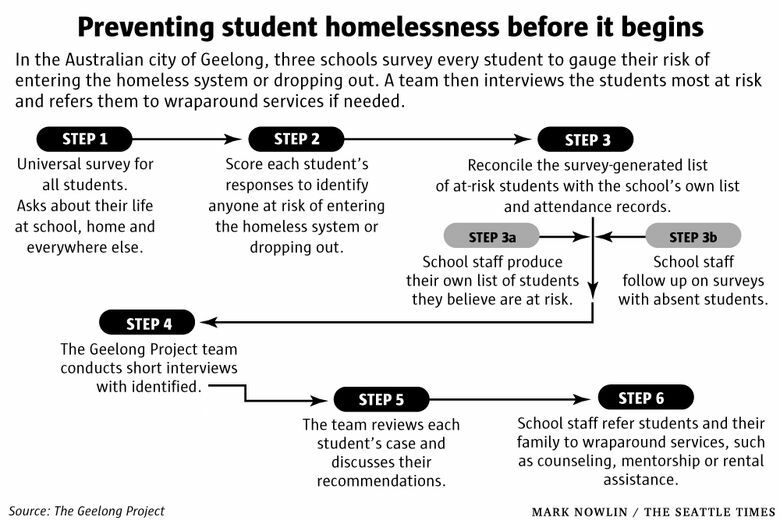 In Geelong, the questionnaire used at the three pilot schools surveys each student about their home life, including where they slept the previous night; how many times, if ever, they have left home to stay with friends or relatives; if they feel happy or safe at home; and whether they or their families had enough money to buy food. Each student’s responses are then scored for relative risk of becoming homeless or dropping out. Students with greater risk are interviewed and referred to wraparound services if needed. Already, four schools in Ontario, Canada, have imported the Geelong model in a pilot that officials there dubbed the Upstream Project. Early screenings found 3 percent of more than 2,600 participating students are at risk of entering Ontario’s homeless system last school year. At least one other city in the U.S. has expressed interest in the Geelong Project and will likely start using the survey at two to four schools this academic year, according to Matt Morton, a research fellow with Chapin Hall at the University of Chicago. As part of the Raikes Foundation grant, Morton will oversee the planning phase in Seattle over the next 10 months. Ultimately, he’ll study whether the Seattle school district’s and the city’s wide array of public agencies and homeless-service providers have the ability and financial backing to fully support a pilot of the Geelong Project starting next school year. Morton said Seattle already has a lot going for it, at least in terms of the resources the community provides around youth homelessness. What’s missing, he said, is a centralized network to connect youth at risk of entering the homeless system with those services they need to avoid that trauma. Daniel Zavala oversees policy and strategic communications for Building Changes, a Seattle-based nonprofit that works to reduce youth and family homelessness in Washington state. (Building Changes receives financial support from the Raikes Foundation, as well as the Bill & Melinda Gates Foundation, which supports Education Lab). While Zavala said it’s too early to tell whether the Geelong Project would work in Seattle, Zavala said there’s likely local support to try something on the front end to reduce student homelessness here. “It’s not an issue that’s going to go away on its own,” Zavala said. “Right now we have the public appetite and political will around the issue, but we also happen to have the funding available,” he said, referencing the wide margin of support in last month’s election for the city of Seattle’s new education levy. That levy will provide about $4.2 million to address the rising number of homeless students in Seattle.